Wednesday afternoon was nearly an unqualified success. The two Lolas ran well throughout the session. The minor leaks were gone. The reason? “J-B Weld – the leaks are gone. So much for “high tech.” In even the very top level of racing, there are still those things about which the shade tree mechanic can say “I’ve done that!” But it wasn’t all good. Guy Smith was piloting the #20 Lola and “we saw his tire starting to go down (on the telemetry from the car),” said Team Manager Randall Kelsey. “We radioed him, but he couldn’t understand us and kept his pace into turn 1, where the car ”went to full lock – he (Guy) did a great job saving it, he didn’t hit anything, but the tire came off the wheel, and the car had to be retrieved. There was some damage to the floor – we have a spare – otherwise it’s fine.” The team was getting a delivery of spares in the afternoon. A new engine for #16 had already arrived, to replace the temporary installation of the engine out of the #20 Lola. Meanwhile, they were chasing handling problems in the #20 Lola. After the session, they’d have to check everything, but were confident that they’d find the cause, probably damage as a result of Guy Smith’s puncture on Wednesday afternoon. About that they were half right. It wasn’t found before the qualifying session, but during, and yes, it was the result of residual damage from the Wednesday Turn 1 blowout. The outcome of all that was that the two Dyson Lola B06 / 10s finished up in fifth and sixth, the team pleased that those positions could be accomplished with one broken car – #20 suffered suspension failure early in the session. Guy Smith had just set his qualifying time on his first timed “out” lap, and he reckoned a lower time still was on the cards - before he arrived at Turn One and felt the car suddenly go loose in the rear. The team later concluded that the failure was most a result of the #20 car’s puncture problem the day before. With the loss of the morning session, and #16 with its unmapped engine, the two cars made up the third row of the grid, after the two Audis and the two Porsches. Friday’s single session, after qualifying, is one many teams skip, done with their preparation and not interested in risking the hardware. 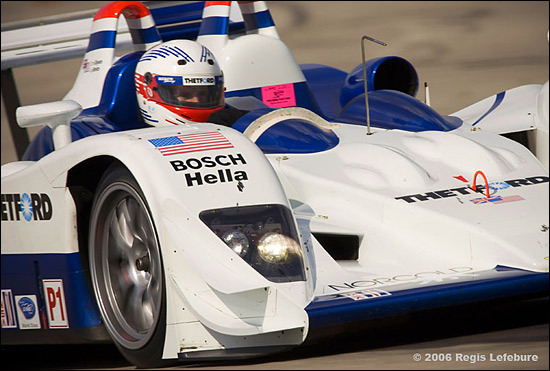 Dyson Racing wasn’t in a position to engage in that luxury. James Weaver was working with the set-up on a #16 car that was suffering from understeer, his best lap coming late in the session after going a bit “tighter.” Chris Dyson tested some new compound rubber, and was about to turn over to Guy Smith when a large volume of white smoke caused him to shut down while exiting pit lane. He immediately reported that the engine seemed to be fine; the shut down was precautionary. Later, it seemed it was the continuation of the relatively benign (but sometimes spectacular) turbo oil loss. Rob Dyson was explaining that and the position / performance of a scavenging pump in the paddock later, and told us, “I think we’ll be OK.” Race day was upon us. “Finally!” some would say. 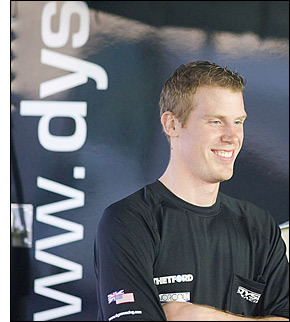 “Already?” would be another thought at Dyson Racing. Morning warm-up was uneventful for most, but the two Dyson Lolas would move up a starting position on the grid, to fourth and fifth. The pole-winning #2 Audi R10 TDI had a heat exchanger failure, and the repair would cause it to be required to start from pit lane when it could not be repaired in time to make the grid. This was a week of nearly perfect weather, and race day was no exception. It was 77° F. when the green flag flew at 10:45 AM for the start of the 54th 12 Hours of Sebring. Guy Smith challenged the two Porsches early, then just thirteen minutes in was back in the pits with a punctured right rear tire – that one again. Guy was in position four when he came in; he went out in fourteenth. So much for qualifying position in a twelve hour race. There were only eleven hours and forty-seven minutes to go now. Unfortunately, it would be only twenty minutes before the Guy Smith / Chris Dyson Lola B06 / 40 AER returned to the team’s pit just beyond the entrance to pit lane (often called “pit in”). A second puncture relegated the #20 car to 19th position. Ah, well, there were still eleven hours and twenty-seven minutes to catch up, wasn’t there? Soon after, fifty-one minutes after the start, James Weaver brought the #16 Lola into the pits for a routine, fuel only, stop. Those Michelins would see another stint. So, two punctures and a fuel stop, both cars were now on their way, and it should have been time for the Dyson team to take a deep breath. Nope. Almost simultaneously with James’ return to the track, Guy Smith slowed and stopped at turn 12. What now? It felt to Guy like it ran out of fuel, but the car had been refueled on the previous stops for punctures. It took two tries to restart (in these systems, that’s “recycle the ignition” as certain other checks and activities take place in the electronics; but it’s the same now with our street cars, isn’t it? ), and Guy was into the pits again, this third time to figure out what had gone wrong. It was something that had not happened in 1,100 miles of testing. No time for standing around head-scratching of course, so they first had Guy engage the reserve fuel pump; that wasn’t it. All things considered, it really didn’t take long to determine the cause of the problem. There is a sensor for engine oil pressure of course, and a switch that will shut the engine down when that pressure falls below a pre-set value. That value’s initial setting was too high for these racing conditions, so it was reset to a still-safe lower value and the Lola B06 / 10 AER was once again on its way. 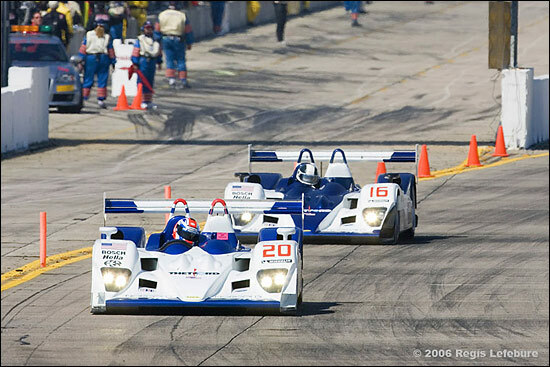 At an hour into the race the #20 Lola was five laps down, while the #16 car was one of only four cars on the lead lap. That wouldn’t last. Just a few minutes later, James came to a stop at turn ten. It was the same problem as the sister car, and the #16 car restarted, returned to the pit, did the reset, was refueled, had tires changed, and Weaver was on his way once again. It was noon. The on-course stop, and additional time in the pit had now put the #16 Lola three laps down from the leading #1 Audi at an hour and a half into the race. The #20 Dyson entry was further back still after its three incidents. The reasonable expectation to learn more about the car and complete seventy percent of the race laps for points was still in play. The more hopeful scenarios were remote at best. Guy Smith finally put in a “normal” full stint of fifty-one minutes before refueling; no tires this time. The Michelins were able to go two stints; that’s good news. Two hours into the race, James Weaver was nearing the end of his second stint, and had picked up some ground; he was now shown on lap sixty-two just one lap behind the leading Audis. That’s about two minutes, not much in this race. Spirits were good. Chris Dyson said, with a smile, that the race pace of the two Lolas was, “Just fine. Good in the gasoline powered division.” James handed over to Butch Leitzinger after two hours and seven minutes. But after selecting a back-up fuel map, he was again on his way. Meanwhile, Guy Smith had put in another trouble-free stint of fifty-eight minutes, and turned the car over to Chris Dyson two hours and forty-five minutes into the twelve hour race. The car was running pretty well now. Both were. For all of seventeen minutes. This is a busy business sometimes. Butch’s braking wasn’t feeling right, and instruments showed brake bias strongly toward the front in the “safety pin” hairpin – that’s the nearly 180 degree turn in front of the Chateau Elan hotel – indicating weakened rear brakes. The reading was even more toward the front after braking into the pit, so the team immediately went for the rear brakes. Bingo! A leak! Fix that, bleed the brakes, download a new fuel map, and out thirteen minutes later. Just before Butch’s stop, the clock marked the end of the third hour; #16 was three laps down, in third, while #20 was five laps down, in fourth place among the LMP1s. Leitzinger returned to the track thirteen laps down. Following a stop just past three hours Chris Dyson put in a run of sixty-four minutes between stops, between taking fuel and four tires at 2:34 PM. Unhappily, he was back on pit lane just six minutes later to serve time for an alleged pit lane speeding violation and for someone’s goggles up while over the wall on the previous stop. In the meantime, however, the #1 Audi went behind the wall with an overheating problem. Soon after the fourth hour, then, Chris would take over second place, ten laps back of the remaining Audi. Butch Leitzinger brought the #16 Lola in for fuel only just past four hours. Eight hours still to race, Chris Dyson’s ten laps something about eighteen minutes. One “bobble” up front and…..? It wasn’t long before that reverie was interrupted, though. Just as Dyson began setting a series of quick laps as fuel began to burn off, the #20 car again had a problem shutting down over the bumps into Turn 17. That brought Chris in a bit early, thirty-nine minutes after his last stop, for a check, tires, fuel, and a driver change to Guy Smith. 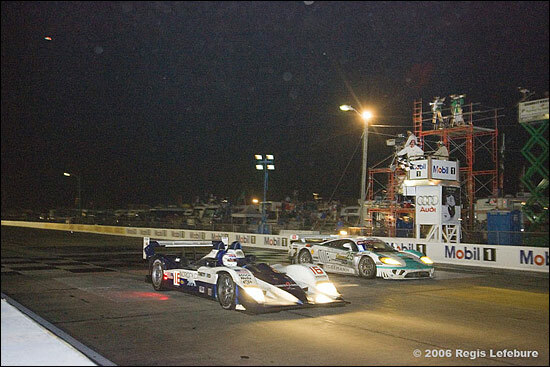 The one hour, forty-five minute stint would be all for the American in the 2006 12 Hours. Meanwhile, Leitzinger had completed two hours, thirty-two minutes in #16, and handed over to Andy Wallace for the latter’s first drive, in a routine tires and fuel stop. Things had been quite smooth, finally, for the car, through two stops and one hundred minutes. Something had to happen, and did. 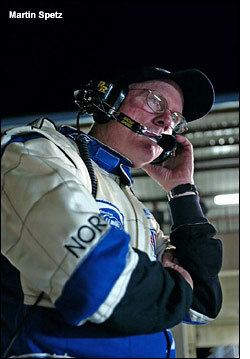 Just before five hours, and only a few minutes after starting his stint, Andy was back with a flat left rear tire. Sensors allow the team to see tires lose pressure, so again, Andy was able to pit for the change and avoided any on-course catastrophe. Meanwhile, Guy Smith had suffered another on-course engine shut-off, starting a sequence of problems that would finally sideline the #20 Lola for good. The combination put the two cars in second and third place, just seconds apart on the same lap, 141, eight behind the leader at the end of five hours. Just twelve minutes later, Guy Smith came in, trailing smoke all the way down pit lane on his way behind the wall. With a further oil pressure loss, he shut down the AER V8. 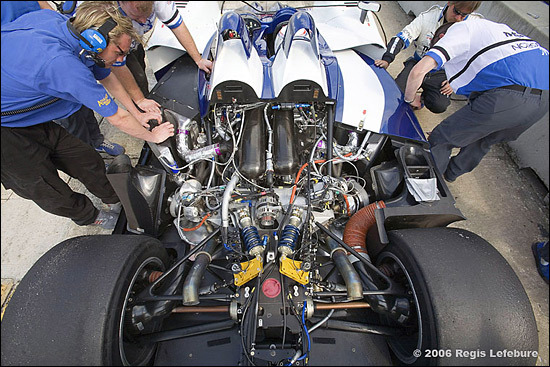 With 144 laps complete, the Lola would get an oil pump transplant in a one-hour, six-minute stop. At five and a half hours, Andy and the #16 Lola were in second place in LMP1, but had slipped to ten laps down, still within range if the Audi ahead had trouble. It was widely believed up and down the pits, that the Audi was running hot. Overheating had retired the sister car. #16 was running strong. In the midst of the first really major failure – the oil pump on the Dyson / Smith Lola – hope for a surprise was still alive. 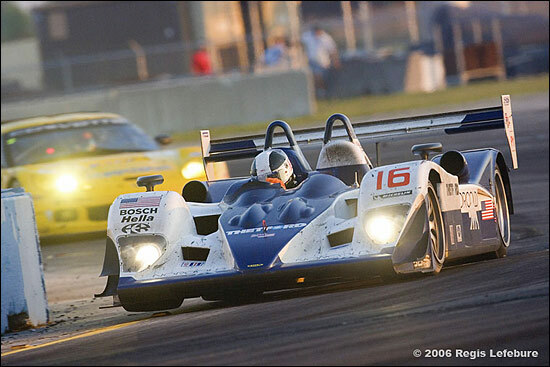 Andy turned the #16 car over to James Weaver after a stint totaling 1:45, six hours and forty minutes into the race, and James drove an uneventful hour and a half before turning over to Butch just past eight hours. At the eight hour mark, the car was in second, and had closed to within six laps of the Capello / Kristensen / McNish Audi R10 diesel. It hadn’t been that good for Guy Smith. His #20 had no sooner got back on track after the oil pump replacement than he reported the car “reeks of fuel.” Not good. So back behind the wall, for another repair, this time a fuel system gasket. That took an hour. Still, the team was intent on getting both cars to seventy-percent of the winner’s laps. They calculated they could still lose forty-five minutes and achieve that. 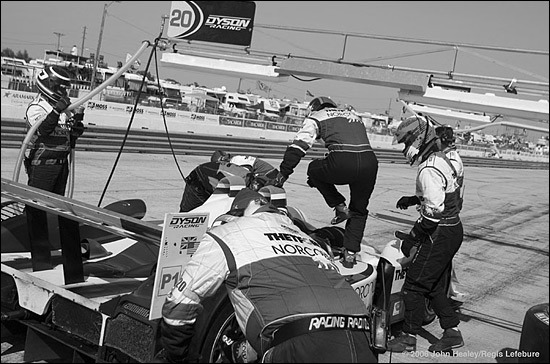 Back to it, then, at 6:10 PM, seven and a half hours into the 54th 12 Hours of Sebring. Owing to attrition elsewhere in the class, the car was still fourth, but was sixty-seven laps back at the eight hour. Just when the effort looked to regain traction, a plastic bag lodged in one of the side radiators spiked the temperatures. 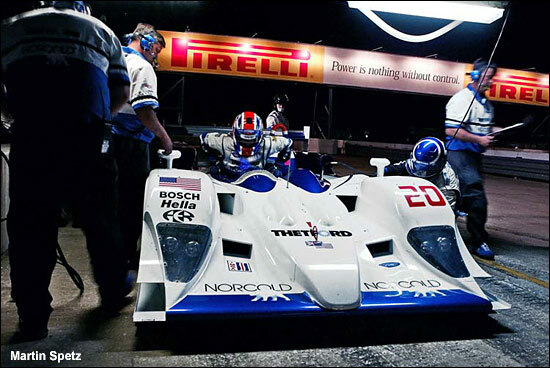 Guy and the crew nursed the overheating car and fought the fight for the next thirty-five minutes, but would retire the Lola thirty-five minutes later at 7:20 PM, after more than eight and a half hours. No points scored for either Smith or Dyson, who were bitterly disappointed, after having one of the quickest cars on the track in the race, and who had hoped to start the 2006 championship campaign with a strong result. It was not to be. By that time, Butch was well into his first hour-long stint. At hour nine, just before his first fuel and tire stop he was in second, six laps behind the leader. The Lola was keeping pace now with the diesel class, too. The second stint in this set was forty-six minutes; the next stop wasn’t entirely routine, the V8 would need a liter of oil – it took a bit to find the fitting – and there was some concern about engine temperature and oil pressure. Andy Wallace took over from Butch at 8:40 PM. 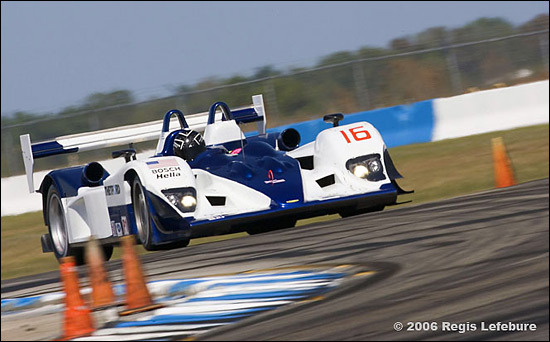 At ten hours in, the #16 Lola had completed 284 laps to the leader’s 291. Still “lurking.” Two hours to go. Prospects Good. Much achieved. 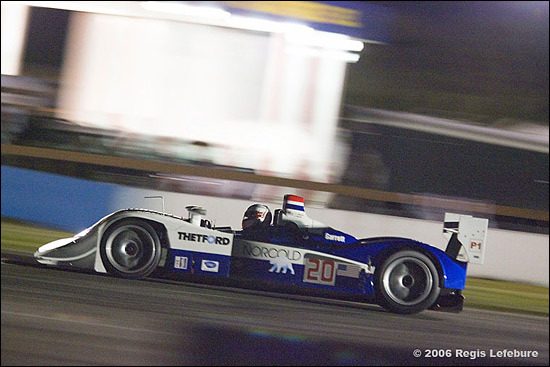 Andy took to the track for a relatively uneventful fifty-four minutes, before pitting for fuel at 9:34 PM, ten hours and fifty minutes into the twelve hour race. Just bring it home, now, for second place. Not so easy, though. In nine minutes, Andy is back, reporting a “horrible sound,” and the car bottoming on the front straight. The crew jumps on the back of the car; are the shocks broken? A spring? They can’t tell. Andy goes back out, but reports it’s worse. (The jumping didn’t help.) So he returns, on leader’s lap 324 at 9:50 PM, just into the final hour. The crew replaces both rear shocks, and raises the ride height two turns. Andy heads back out. The leader has completed lap 328. Andy’s down thirteen laps now. Get it home. A full course caution comes out at 10:00 PM, the course is back to green twenty minutes later. 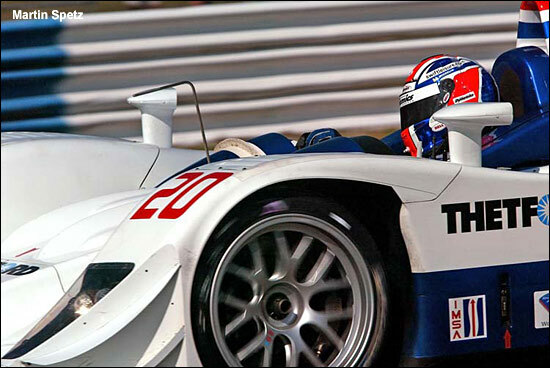 Andy drives it to the finish just twenty-five minutes later, in second place in LMP1 (fifth overall). A podium the first time out, and an overall finish ahead of both Penke Porsches and one of the diesel R10s. And while the #20 car didn’t earn points for its third place in LMP1, the Dyson team enjoys the satisfaction of its drivers sandwiching the winning Audi pilots on the class podium. Butch Leitzinger: "With a brand new car it was likely we'd have some difficulties, what was surprising was that we had so few. We are very happy to be standing here. 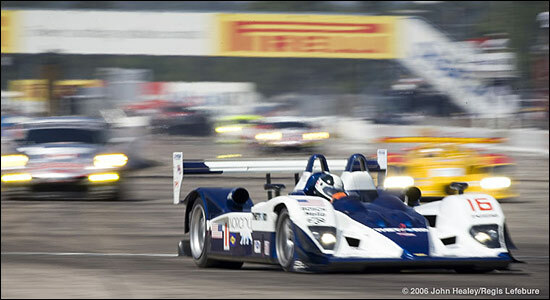 As you drive around this track there is so much energy from the fans, you can tell its Sebring!" James Weaver: (how was the track this year) "It was consistently grippy. " (about the car) "When I drove it, it worked fine, it was Butch and Andy that broke it". (Is this car easier to handle than last year’s) "We've been working very hard this year to stay in shape, its definitely less work (to drive) than last year's car. I'm the oldest, so I guess I'm in the best shape." With the experience of a twelve hour race in its first outing, barely fifty days after it turned a wheel for the first time, Lola B06 / 10 and the Dyson team appear ready to take on what comes next. 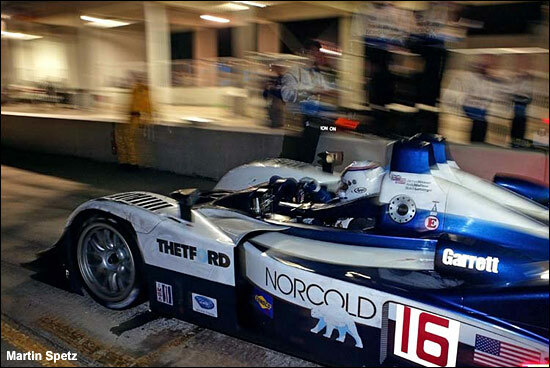 Testing, of course, and then that very different evening street race in Houston in May. They’re eager to get there.